ST. PETERSBURG — The University of Lethbridge won fourth place overall at an international programming challenge pitting them against other top coding talent from universities around the world in St. Petersburg, Russia. At the Association for Computing Machinery‘s International Collegiate Programming Contest (ICPC) 2013 world finals, teams chowed on lunch in a large hall and paid rapt attention to large screens playing what looks like an early arcade game out of the 1980s. 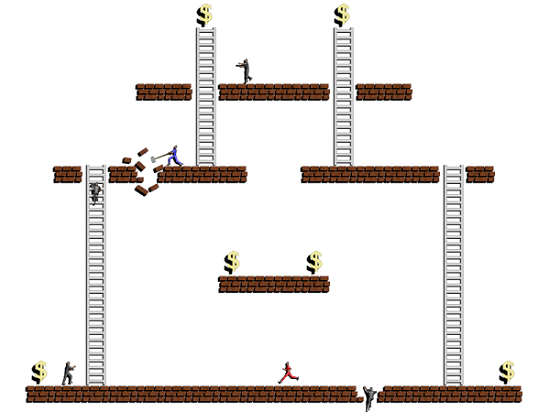 At first glance you might see the platforms, ladders, and the floating dollar-sign icons and think this is Donkey Kong or Lode Runner. But it’s actually the game designed for this year’s ICPC Challenge, an annual exercise that sees top computer programming students try their hand at some basic artificial intelligence while coding in C++ or Java. The University of Lethbridge students collected math-themed wall clocks for their coding efforts. It adds another dimension to this annual competition that brings together the world’s top computer programming talent in one place, according to David Sturgill, director of ICPC Challenge and a professor at North Carolina State University. While the main competition taking place here on Tuesday will showcase teams submitting answers to problems that will either be right or wrong, here there’s a little more wiggle room. “Here, my solution may be a little better than yours, but that just means I’m going to win eight out of 10 times we play and you’ll still win two out of 10 times,” he says. The challenge is about developing an idea and then continually refining it. This year’s challenge tasked students with programming the behaviour of a stick-figure man that would climb ladders, run away from zombies (other, slower stick figures with out-stretched arms), break platforms in order to create traps, and all with the goal of collecting as much money as possible. The dollar sign icons float in certain areas of a grid-like map, and once collected take a few seconds to reappear. The University of Lethbridge’s program, dubbed Alternate Version, frenetically sprinted around the map and scooped up the money while deftly avoiding and trapping zombies. IBM Corp. has been the title sponsor of ICPC since 1997 and uses the event to recruit new talent. It has open job offers on the table for all the students that have made it to the world finals. There will be special incentives for the teams that win medals at the main contest tomorrow, in the form of cash prizes. The awards for students doing well in the challenge game are less compelling, but IBM still takes note of the top contenders, says Ian Simpson, the general manager of IBM’s Science and Technology Center in Moscow. Most students will have their attention on the main event tomorrow and the challenge is considered a more fun exercise, Sturgill says. Still, it’s another opportunity to get in the lime light as the top four teams will get stage time at the final ceremony. “There are some teams that choose to focus their attention here if they don’t think they can get on stage in the other competition,” he says. The Ludwig-Maximilians Universitat Munchen won first prize in the challenge. The University of Toronto also placed well, finishing in the final 8.